Electric telegraphy on land has put a vast distance between itself and the mechanical signalling of Chappé, just as the scope and availability of the French invention are in high contrast with the rude signal fires of the primitive savage. As the first land telegraphs joined village to village, and city to city, the crossing of water came in as a minor incident; the wires were readily committed to the bridges which spanned streams of moderate width. Where a river or inlet was unbridged, or a channel was too wide for the roadway of the engineer, the question arose, May we lay an electric wire under water? With an ordinary land line, air serves as so good a non-conductor and insulator that as a rule cheap iron may be employed for the wire instead of expensive copper. In the quest for non-conductors suitable for immersion in rivers, channels, and the sea, obstacles of a stubborn kind were confronted. To overcome them demanded new materials, more refined instruments, and a complete revision of electrical philosophy. 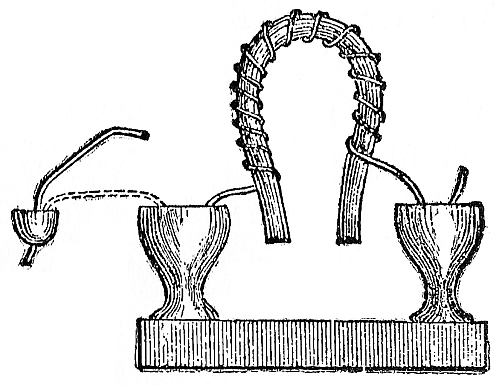 As far back as 1795, Francisco Salva had recommended to the Academy of Sciences, Barcelona, the covering of subaqueous wires by resin, which is both impenetrable by water and a non-conductor of electricity. Insulators, indeed, of one kind and another, were common enough, but each of them was defective in some quality indispensable for success. Neither glass nor porcelain is flexible, and therefore to lay a continuous line of one or the other was out of the question. Resin and pitch were even more faulty, because extremely brittle and friable. What of such fibres as hemp or silk, if saturated with tar or some other good non-conductor? For very short distances under still water they served fairly well, but any exposure to a rocky beach with its chafing action, any rub by a passing anchor, was fatal to them. What the copper wire needed was a covering impervious to water, unchangeable in composition by time, tough of texture, and non-conducting in the highest degree. Fortunately all these properties are united in gutta-percha: they exist in nothing else known to art. Gutta-percha is the hardened juice of a large tree (Isonandra gutta) common in the Malay Archipelago; it is tough and strong, easily moulded when moderately heated. In comparison with copper it is but one 60,000,000,000,000,000,000th as conductive. As without gutta-percha there could be no ocean telegraphy, it is worth while recalling how it came within the purview of the electrical engineer. In 1843 José d’Almeida, a Portuguese engineer, presented to the Royal Asiatic Society, London, the first specimens of gutta-percha brought to Europe. A few months later, Dr. W. Montgomerie, a surgeon, gave other specimens to the Society of Arts, of London, which exhibited them; but it was four years before the chief characteristic of the gum was recognized. In 1847 Mr. S. T. Armstrong of New York, during a visit to London, inspected a pound or two of gutta-percha, and found it to be twice as good a non-conductor as glass. 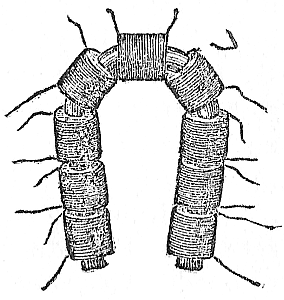 The next year, through his instrumentality, a cable covered with this new insulator was laid between New York and Jersey City; its success prompted Mr Armstrong to suggest that a similarly protected cable be submerged between America and Europe. Eighteen years of untiring effort, impeded by the errors inevitable to the pioneer, stood between the proposal and its fulfilment. In 1848 the Messrs. Siemens laid under water in the port of Kiel a wire covered with seamless gutta-percha, such as, beginning with 1847, they had employed for subterranean conductors. This particular wire was not used for telegraphy, but formed part of a submarine-mine system. In 1849 Mr. C. V. Walker laid an experimental line in the English Channel; he proved the possibility of signalling for two miles through a wire covered with gutta-percha, and so prepared the way for a venture which joined the shores of France and England. In 1854 Cyrus W. Field of New York opened a new chapter in electrical enterprise as he resolved to lay a cable between Ireland and Newfoundland, along the shortest line that joins Europe to America. He chose Valentia and Heart’s Content, a little more than 1,600 miles apart, as his termini, and at once began to enlist the co-operation of his friends. Although an unfaltering enthusiast when once his great idea had possession of him, Mr. Field was a man of strong common sense. From first to last he went upon well-ascertained facts; when he failed he did so simply because other facts, which he could not possibly know, had to be disclosed by costly experience. Messrs. Whitehouse and Bright, electricians to his company, were instructed to begin a preliminary series of experiments. They united a continuous stretch of wires laid beneath land and water for a distance of 2,000 miles, and found that through this extraordinary circuit they could transmit as many as four signals per second. They inferred that an Atlantic cable would offer but little more resistance, and would therefore be electrically workable and commercially lucrative. In 1857 a cable was forthwith manufactured, divided in halves, and stowed in the holds of the Niagara of the United States navy, and the Agamemnon of the British fleet. The Niagara sailed from Ireland; the sister ship proceeded to Newfoundland, and was to meet her in mid-ocean. When the Niagara had run out 335[Pg 42] miles of her cable it snapped under a sudden increase of strain at the paying-out machinery; all attempts at recovery were unavailing, and the work for that year was abandoned. The next year it was resumed, a liberal supply of new cable having been manufactured to replace the lost section, and to meet any fresh emergency that might arise. A new plan of voyages was adopted: the vessels now sailed together to mid-sea, uniting there both portions of the cable; then one ship steamed off to Ireland, the other to the Newfoundland coast. Both reached their destinations on the same day, August 5, 1858, and, feeble and irregular though it was, an electric pulse for the first time now bore a message from hemisphere to hemisphere. After 732 despatches had passed through the wire it became silent forever. In one of these despatches from London, the War Office countermanded the departure of two regiments about to leave Canada for England, which saved an outlay of about $250,000. This widely quoted fact demonstrated with telling effect the value of cable telegraphy. Now followed years of struggle which would have dismayed any less resolute soul than Mr. Field. The Civil War had broken out, with its perils to the Union, its alarms and anxieties for every American heart. But while battleships and cruisers were patrolling the coast from Maine to Florida, and regiments were marching through Washington on their way to battle,[Pg 43] there was no remission of effort on the part of the great projector. Taking his stand upon this endorsement, Mr. Field now addressed himself to the task of raising[Pg 44] the large sum needed to make and lay a new cable which should be so much better than the old ones as to reward its owners with triumph. He found his English friends willing to venture the capital required, and without further delay the manufacture of a new cable was taken in hand. In every detail the recommendations of the Scientific Committee were carried out to the letter, so that the cable of 1865 was incomparably superior to that of 1858. First, the central copper wire, which was the nerve along which the lightning was to run, was nearly three times larger than before. The old conductor was a strand consisting of seven fine wires, six laid around one, and weighed but 107 pounds to the mile. The new was composed of the same number of wires, but weighed 300 pounds to the mile. It was made of the finest copper obtainable. 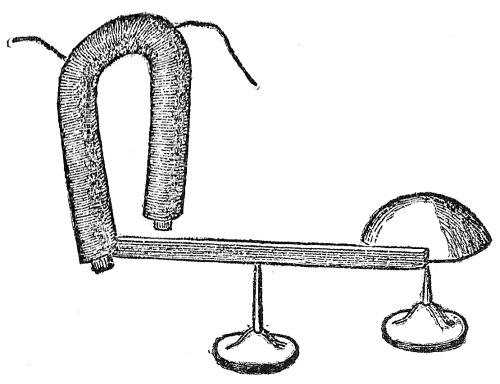 To secure insulation, this conductor was first embedded in Chatterton’s compound, a preparation impervious to water, and then covered with four layers of gutta-percha, which were laid on alternately with four thin layers of Chatterton’s compound. The old cable had but three coatings of gutta-percha, with nothing between. Its entire insulation weighed but 261 pounds to the mile, while that of the new weighed 400 pounds. The exterior wires, ten in number, were of Bessemer steel, each separately wound[Pg 45] in pitch-soaked hemp yarn, the shore ends specially protected by thirty-six wires girdling the whole. Here was a combination of the tenacity of steel with much of the flexibility of rope. The insulation of the copper was so excellent as to exceed by a hundredfold that of the core of 1858—which, faulty though it was, had, nevertheless, sufficed for signals. So much inconvenience and risk had been encountered in dividing the task of cable-laying between two ships that this time it was decided to charter a single vessel, the Great Eastern, which, fortunately, was large enough to accommodate the cable in an unbroken length. Foilhommerum Bay, about six miles from Valentia, was selected as the new Irish terminus by the company. Although the most anxious care was exercised in every detail, yet, when 1,186 miles had been laid, the cable parted in 11,000 feet of water, and although thrice it was grappled and brought toward the surface, thrice it slipped off the grappling hooks and escaped to the ocean floor. Mr. Field was obliged to return to England and face as best he might the men whose capital lay at the bottom of the sea—perchance as worthless as so much Atlantic ooze. With heroic persistence he argued that all difficulties would yield to a renewed attack. There must be redoubled precautions and vigilance never for a moment relaxed. Everything that deep-sea telegraphy has since accomplished was at that moment daylight clear to his prophetic view. Never has there been a more signal example of the power of enthusiasm to stir cold-blooded men of business; never has there been a more striking illustration of how much science may depend for success upon the intelligence and the courage of capital. Electricians might have gone on perfecting exquisite apparatus for ocean telegraphy, or indicated the weak points in the comparatively rude machinery which made and laid the cable, yet their exertions would have been wasted if men of wealth had not responded to Mr. Field’s renewed appeal for help. Thrice these men had invested largely, and thrice disaster had pursued their ventures; nevertheless they had faith surviving all misfortunes for a fourth attempt. In 1866 a new company was organized, for two objects: first, to recover the cable lost the previous year and complete it to the American shore; second, to lay another beside it in a parallel course. The Great Eastern was again put in commission, and remodelled in accordance with the experience of her preceding voyage. This time the exterior wires of the cable were of galvanized iron, the better to resist corrosion. The paying-out machinery was reconstructed and greatly improved. On July 13, 1866, the huge steamer began running out her cable twenty-five miles north of the line struck out during the expedition of 1865; she arrived without mishap in Newfoundland on July 27, and electrical communication was re-established between America and Europe. The steamer now returned to the spot where she had lost the cable a few months before; after eighteen days’ search it was brought to the deck in good order. Union was effected with the cable stowed in the tanks below, and the prow of the vessel was once more turned to Newfoundland. On September 8th this second cable was safely landed at Trinity Bay. Misfortunes now were at an end; the courage of Mr. Field knew victory at last; the highest honors of two continents were showered upon him. But the high faith that failed not by the way. What at first was as much a daring adventure as a business enterprise has now taken its place as a task no more out of the common than building a steamship, or rearing a cantilever bridge. Given its price, which will include too moderate a profit to betray any expectation of failure, and a responsible firm will contract to lay a cable across the Pacific itself. In the Atlantic lines the uniformly low temperature of the ocean floor (about 4° C.), and the great pressure of the superincumbent sea, co-operate in effecting an enormous enhancement both in the insulation and in the carrying capacity of the wire. As an example of recent work in ocean telegraphy let us glance at the cable laid in 1894, by the Commercial Cable Company of New York. It unites Cape Canso, on the northeastern coast of Nova Scotia, to Waterville, on the southwestern coast of Ireland. The central portion of this cable much resembles that of its predecessor in 1866. Its exterior armour of steel wires is much more elaborate. The first part of Fig. 59 shows the details of manufacture: the central copper core is covered with gutta-percha, then with jute, upon which the steel wires are spirally wound, followed by a strong outer covering. For the greatest depths at sea, type A is employed for a total length of 1,420 miles; the diameter of this part of the cable is seven-eighths of an inch. As the water lessens in depth the sheathing increases in size until the diameter of the cable becomes one and one-sixteenth inches for 152 miles, as type B. The cable now undergoes a third enlargement, and then its fourth and last proportions are presented as it touches the shore, for a distance of one and three-quarter miles, where type C has a diameter of two and one-half inches. The weights of material used in this cable are: copper wire, 495 tons; gutta-percha, 315 tons; jute yarn, 575 tons; steel wire, 3,000 tons; compound and tar, 1,075 tons; total, 5,460 tons. The telegraph-ship Faraday, specially designed for cable-laying, accomplished the work without mishap. Electrical science owes much to the Atlantic cables, in particular to the first of them. At the very beginning it banished the idea that electricity as it passes through metallic conductors has anything like its velocity through free space. It was soon found, as Professor Mendenhall says, “that it is no more correct to assign a definite velocity to electricity than to a river. As the rate of flow of a river is determined by the character of its bed, its gradient, and other circumstances, so the velocity of an electric current is found to depend on the conditions under which the flow takes place.” Mile for mile the original Atlantic cable had twenty times the retarding effect of a good aerial line; the best recent cables reduce this figure by nearly one-half. In an extreme form, this slowing down reminds us of the obstruction of light as it enters the atmosphere of the earth, of the further impediment which the rays encounter if they pass from the air into the sea. In the main the causes which hinder a pulse committed to a cable are two: induction, and the electrostatic capacity of the wire, that is, the capacity of the wire to take up a charge of its own, just as if it were the metal of a Leyden jar. Let us first consider induction. As a current takes its way through the copper core it induces in its surroundings a second and opposing current. For this the remedy is one too costly to be applied. Were a cable manufactured in a double line, as in the best telephonic circuits, induction, with its retarding and quenching effects, would be neutralized. Here the steel wire armour which encircles the cable plays an unwelcome part. 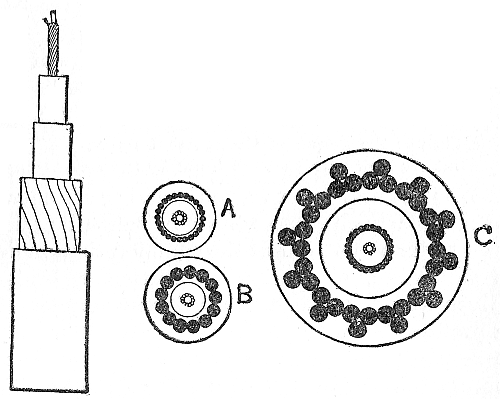 Induction is always proportioned to the conductivity of the mass in which it appears; as steel is an excellent conductor, the armour of an ocean cable, close as it is to the copper core, has induced in it a current much stronger, and therefore more retarding, than if the steel wire were absent. A word now as to the second difficulty in working beneath the sea—that due to the absorbing power of the line itself. 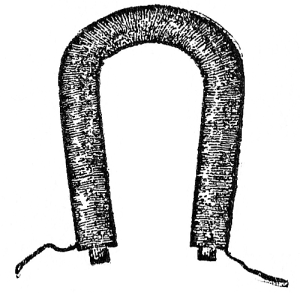 An Atlantic cable, like any other extended conductor, is virtually a long, cylindrical Leyden jar, the copper wire forming the inner coat, and its surroundings the outer coat. Before a signal can be received at the distant terminus the wire must first be charged. The effect is somewhat like transmitting a signal through water which fills a rubber tube; first of all the tube is distended, and its compression, or secondary effect, really transmits the impulse. A remedy for this is a condenser formed of alternate sheets of tin-foil and mica, C, connected with the battery, B, so as to balance the electric charge of the cable wire (Fig. 60). In the first Atlantic line an impulse demanded one-seventh of a second for its journey. This was reduced when Mr. Whitehouse made the capital discovery that the speed of a signal is increased threefold when the wire is alternately connected with the zinc and copper poles of the battery. Sir William Thomson ascertained that these successive pulses are most effective when of proportioned lengths. 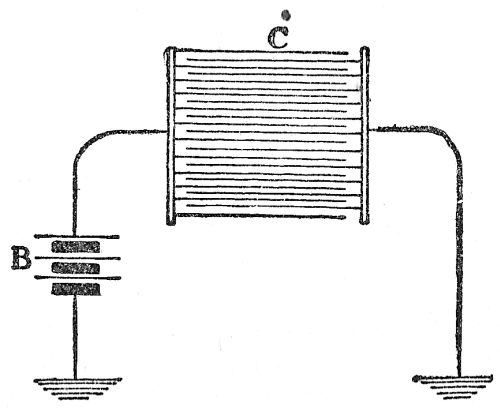 He accordingly devised an automatic transmitter which draws a duly perforated slip of paper under a metallic spring connected with the cable. To-day 250 to 300 letters are sent per minute instead of fifteen, as at first. In many ways a deep-sea cable exaggerates in is of a cable may be in regions of widely diverse electrical potential, or pressure, just as the readings of the barometer at these two places may differ much. If a copper wire were allowed to offer itself as a gateless conductor it would equalize these variations of potential with serious injury to itself. Accordingly the rule is adopted of working the cable not directly, as if it were a land line, but indirectly through condensers. As the throb sent through such apparatus is but momentary, the cable is in no risk from the strong currents which would course through it if it were permitted to be an open channel. 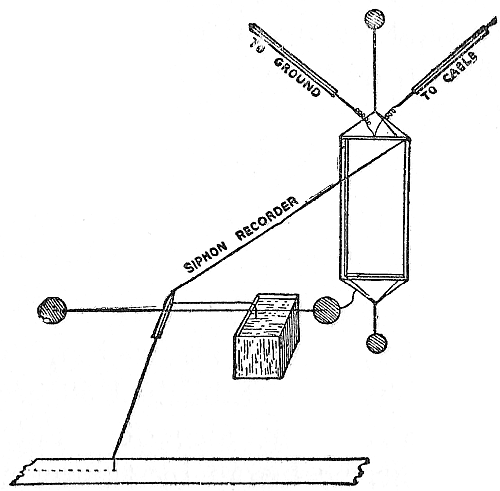 At first in operating the Atlantic cable a mirror galvanometer was employed as a receiver. The principle of this receiver has often been illustrated by a mischievous boy as, with a slight and almost imperceptible motion of his hand, he has used a bit of looking-glass to dart a ray of reflected sunlight across a wide street or a large room. On the same plan, the extremely minute motion of a galvanometer, as it receives the successive pulsations of a message, is magnified by a weightless lever of light so that the words are easily read by an operator (Fig. 61). This beautiful invention comes from the hands of Sir William Thomson [now Lord Kelvin], who, more than any other electrician, has made ocean telegraphy an established success. In another receiver, also of his design, the siphon recorder, he began by taking advantage of the fact, observed long before by Bose, that a charge of electricity stimulates the flow of a liquid. In its original form the ink-well into which the siphon dipped was insulated and charged to a high voltage by an influence-machine; the ink, powerfully repelled, was spurted from the siphon point to a moving strip of paper beneath (Fig. 62). It was afterward found better to use a delicate mechanical shaker which throws out the ink in minute drops as the cable current gently sways the siphon back and forth (Fig. 63). Minute as the current is which suffices for cable telegraphy, it is essential that the metallic circuit be not only unbroken, but unimpaired throughout. No part of his duty has more severely taxed the resources of the electrician than to discover the breaks and leaks in his ocean cables. One of his methods is to pour electricity as it were, into a broken wire, much as if it were a narrow tube, and estimate the length of the wire (and consequently the distance from shore to the defect or break) by the quantity of current required to fill it.